The giant thorny-headed worm Macracanthorhynchus hirudinaceus is a zoonotic acanthocephalan species with a worldwide distribution. Its natural definitive hosts are primarily pigs and wild boars (Sus scrofa), and scarabaeid beetles serve as the intermediate host. To date, there has only been one record of this acanthocephalan in Japan: a Ryukyu wild boar (Sus scrofa riukiuanus) hunted in 1973 on Amami Island, faraway from the Japanese mainland. The present study reports the second case of this acanthocephalan in Japan: a Japanese wild boar (Sus scrofa leucomystax) hunted in May 2017 in Yamaguchi Prefecture, the westernmost part of the Japanese mainland (Honshu). More than a dozen acanthocephalans (123 to 233 mm in length and 5 to 6 mm in width) were found with their proboscides inserted deeply into the intestinal wall, forming grossly visible nodules on the external surface. Isolated worms underwent a molecular genetic characterization of the ribosomal RNA gene (rDNA) and mitochondrial cytochrome c oxidase subunit 1 gene (cox-1). Long rDNA nucleotide sequences (5870 to 5890 bp) spanning the beginning of the 18S rDNA through to the 28S rDNA, including the internal transcribed spacer regions, and 1384-bp cox-1 nucleotide sequences were obtained. 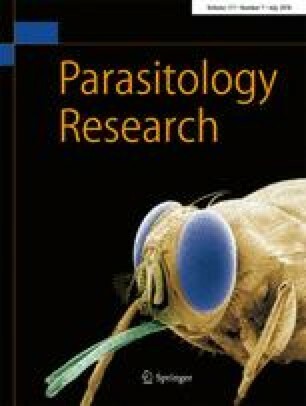 In the future, in conjunction with the accumulation of molecular genetic data of multiple M. hirudinaceus isolates from different endemic localities abroad, our data may help to postulate the origin or present transmission status of this extremely rarely encountered acanthocephalan in Japan. We would like to express our sincere thanks to the local hunters and municipal officers engaged in the protection of wildlife in Shimonoseki City, Yamaguchi Prefecture, Japan, who made this study possible. We are indebted to Professor Emeritus Shuhei Tanaka, Faculty of Agriculture, Yamaguchi University, for his help with the SEM.